We consider a digital patient to be a person who is part of a community that is well acquainted with advanced technology, and is open also to medical applications. This project aims to make such patients capable of managing assistive technology devices for monitoring their health conditions, and also to train and improve their opportunities for social contact. The immediate goal of this study is the definition of design criteria for a portable, personal piece of equipment that could help people with physical impairments (eg due to age or disease) by augmenting their ability to communicate. Technology could also improve the independence of such people by allowing them to practice autonomous social interaction. However, the success of an assistive device depends on a good level of cooperation between the patients and the professional who trains them in its use. This project faces the human factor issues in an original way, recruiting students from high school as caregiver volunteers, under teachers' and professional caregivers supervision. Students have shown a natural attitude to provide effective help, so this cooperation appear to be a major factor for success. We can say that the final goal of providing patients with significant help is the the transformation of their impairment into a diverse ability. The achievement of this goal is conditioned by human factors. This issue widens further the patients' needs. These observations lead us to introduce the ambient as a scalable entity by which context is defined through typical requirements, rather than costly and possibly unpredictable individual requirements. The portable processing and radio-transmitting unit, showing the sensor-carrying belt, its position over the thorax. We have introduced a hierarchy of ambients to represent the global, distributed system of services in a standardized way, taking into account communication between home, the doctors office and emergency units. The first ambient (the domestic ambient) is closely tied to patient needs, while the definition of communication between patient and doctor (low-risk ambient) and patient and hospital (emergency ambient) could easily be conceived as part of a standard service network. These latter two thus belong to the digital citizen concept rather than the digital patient. Design of the first ambient required specific attention, since it contains the contextual data, while the design of service networks involve general-purpose specifications. The domestic ambient supplies data, which are analysed following two main paths. Real-time software is used for signal acquisition and processing, alarm generation and patient/doctor cooperation, where the main aim is to provide emergency assistance. Batch processing is used for data mining, knowledge discovery and decision-making support, where the main aim is to detect and treat chronic disease. Particular care has been dedicated to any operation affecting the quality of the acquired data, including the problem of heterogeneous data, which is typical of the medical field.We built our research from the bottom up, developing original algorithms for signal processing and defining criteria for data access. In particular, algorithm performance is enhanced by using a priori knowledge derived from physiology, individual data patient records and the experience available in the BIM Lab and partners. ISIA (Istituto Superiore per le Industrie Artistiche) Higher Institute for Artistic Industry of Florence (design of wearable setup). We believe our research and experience have led to the development of effective new equipment for continuously monitoring multi-channel vital signs over extended periods of time. This is assured by embedding the sensors in a simple wearable setup. 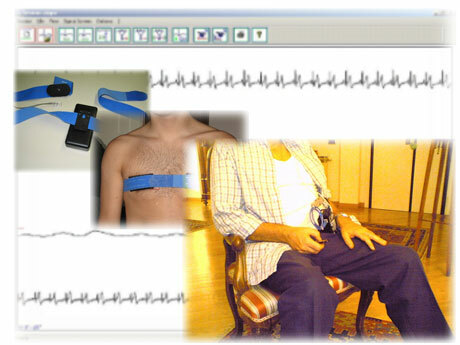 The digital patient will emerge from this experience if we are able to document that the unique features of COMPASS are providing specific help. In other words, our digital patients will be confident and comfortable enough with their own portable vital-sign monitors to reduce medical interventions and possibly hospital admissions. For people with disabilities, we are planning to validate the organization model and to evaluate its application in other places. Are 'ambients' a proper approach to unify the organization of those who care for the patients? Will the continuing experience at AIAS and in Florence show the final correct specification for personal monitors under each aspect (hw/sw, ergonomic, procedures, interfaces..)? Is it possible to combine system reliability with aesthetic and ergonomic values? Is the enthusiastic, fresh approach of high-school students a major factor in the success of the project? Finally, will the project provide validated protocols for patient monitoring and assistance for people with disabilities?